Students lacked opportunities to engage with real-world and cross-curricular learning experiences in STEM, which resulted in limited student engagement and inspiration. New, integrated science, technology, engineering, and math (STEM) curriculum for 10th grade students linking Common Core State Standards for Mathematics and the Next Generation Science Standards. The team defined student practices and culture for rigorous, real-world, project-based learning to be used across disciplines and classrooms. The team of STEM teachers meet on a regular basis to work solely on developing the STEM II curriculum. The STEM professional learning community is effective for both developing STEM II curriculum as well as defining processes for collaboration on content and project development for STEM in the future. The Brooks College Preparatory High School design team created authentic STEM learning experiences for their students through project-based learning. 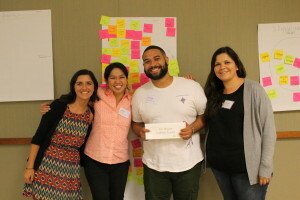 Members from the STEM department collaborated on a new teacher-created curriculum that integrated STEM subjects including math, engineering, computer programming, and science, among others. The team worked not only on content, but also on highly engaging delivery tactics that would drive improved academic performance. In 2014-2015, in partnership with the TrueSchool Team, some members of the Brooks STEM team pioneered development of a STEM I curriculum for 9th grade. Students have a block of science and a block of math taught by dual-certified teachers to promote natural transdisciplinary learning and applications. In 2015-2016, the school design team took on new members for their next project: developing the second year of curriculum, STEM II for 10th grade students. They plan to continue to build a scaffolded, rigorous, integrated STEM curriculum across all grades as their students progress through high school. The Brooks design team had an increased focus on hands-on learning and broader teacher collaboration including all 14 instructors in the STEM department. The teachers met on a regular basis to develop curriculum together and to plan engaging, project-based lessons. An important complement to project-based learning was the school’s process of standards-based grading, a system that primarily assesses student mastery of skills. A key element of standards-based grading is student-specific, focused feedback on strengths and areas of improvement. This was an important element of the curriculum to promote student exploration and ownership of their increased mastery. In addition to implementing the new STEM II curriculum with 10th grade students, the school design team led a school-wide STEM Exhibition to promote the culture of project-based learning. All grades did a hands-on project related to the same area of STEM; each grade had a slightly different focus with applications to real world problems. In the spring semester, all students presented their projects at the Exhibition, which was open to invited guests and all members of the school community. At Brooks, the school design team is working to build a culture of STEM rooted in excellent and highly relevant content for their students. The Brooks school design team developed a STEM department that authentically and intentionally coordinated each of the four fields of study: science, technology, engineering, and math. The team took a highly disciplined approach to creating these new units by leveraging the Understanding by Design framework to backwards plan to ambitious objectives and create highly-engaging, inquiry-based lessons for students. The STEM department and school design team also completed a full Japanese Lesson Study cycle including instructional materials research and research lesson. 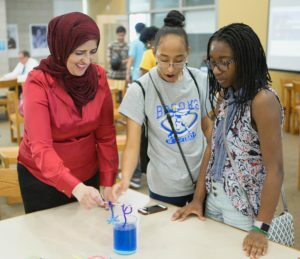 The Brooks design team worked with community partners for students to tackle real-world problems through applied research and problem-solving. The school design team aimed to elevate their STEM instruction from combined math and science to a truly integrated curriculum providing students with a deep understanding of concepts across the fields of STEM and associated disciplines. In the 2016-2017 school year, the Brooks design team took on the challenge of developing curriculum for the penultimate year: STEM III. After the foundation of STEM I and STEM II, students will select an advanced placement course from several options in their senior year. The team aims to expand the real-world applications by partnering with private sector companies and community organizations to provide on-site learning opportunities, speakers, and sector-specific projects. They will be a model of a “learning happens everywhere” approach in which students get out of the building and tackle challenges in broader Chicago. As they develop the STEM III curriculum, they will assess vertical alignment with STEM I and STEM II and improve the curricula to provide a student experience that is scaffolded for increasing rigor, skill development, and college and career readiness in STEM fields. In response to their innovative STEM curriculum and competency-based progression model, Brooks received the Breakthrough Schools grant, receiving additional funds to expand this work and serve as a model for integrated, real world, competency-based learning across Chicago. Brooks prepares students to be global leaders through a rigorous and enriched academic experience, utilizing such strategies as cooperative learning and inquiry requiring higher-order thinking skills. Brooks is a selective enrollment school serving 834 students in grades 9-12. Brooks serves 74% low-income students.